An action-adventure game featuring RPG elements, set in a fantasy world. 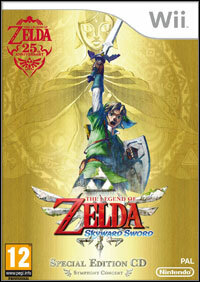 It is the second installment (to be released for Wii) in the iconic Nintendo series, The Legend of Zelda. The Legend of Zelda: Skyward Sword for Wii is an action-adventure game, and the second installment in the The Legend of Zelda series released for that console. Shigeru Miyamoto - Nintendo's most influential game maker was the main designer of the game. In The Legend of Zelda: Skyward Sword for Wii, the player assumes the role of Link. He has his roots in the place known as Skyloft. These are a group of islands floating in the air. Growing up in a peaceful environment and performing casual tasks. One day, Link finds a sword. It is a powerful, enchanted weapon containing a spirit. It turns out there is a land taken over by evil forces beneath Skyloft, and it awaits its savior. With the power of the Skyward Sword and advice it delivers, Link sets out for an amazing journey around both the worlds, trying to find out about the reasons for the separation that occurred between the worlds. In The Legend of Zelda: Skyward Sword for Wii, Link fights his enemies with a few available weapons and special accessories. These include the famous sword in combination with the shield, a bow, a slingshot, bombs, a spy-beetle and a whip, which allows to solve certain puzzles. A great feature of the game is the complexity of controls by which the player interacts with the in-game environment. The game utilizes both the Wiimote and Nunchuck combined with the MotionPlus device. The game stands out with impressive visuals. In contrast to Twilight Princess, these are rather cheerful. Game score 9.0 / 10 calculated out of 282 players' votes. Expectations before the premiere: 9.4 / 10 calculated out of 100 players' votes.